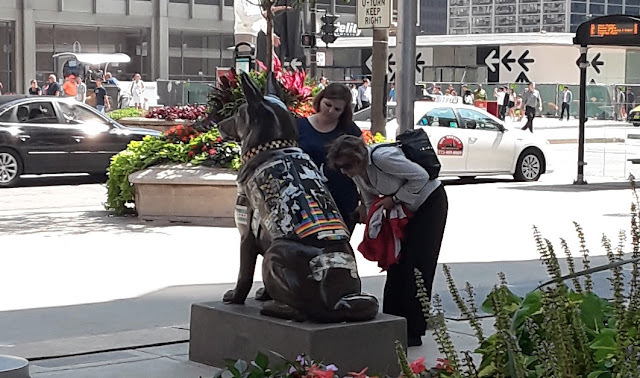 "Savior," (left) a charitable K9 sponsored by Friends of the Town Hall District, stands watch outside of the Wrigley Building this week. "Savior" raised more than $3,500 for two great Chicago charities. This weekend’s fantastic weather is perfect for exploring the city. 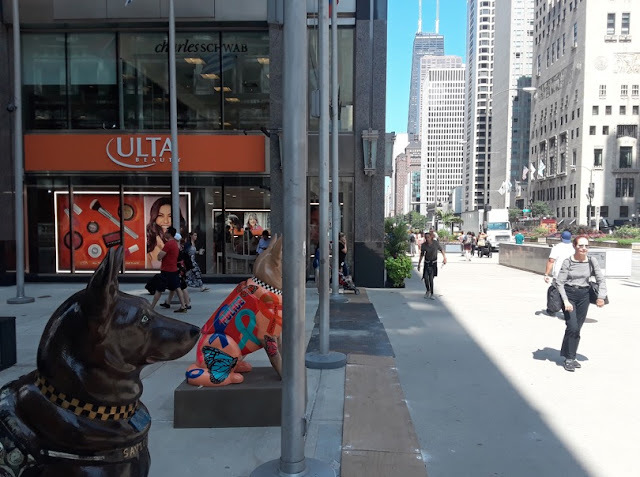 If you find yourself near the Mag Mile, take a minute to check out the K9s For Cops art exhibit—it’s your last chance. More than 120 oversized police dog statues dot Michigan Avenue, each sponsored by a different business or community group and each uniquely decorated by its own artist. But the doggies are heading to new homes early next week. Passers-by spend time with "Savior" and learn more about officers who gave their lives while serving in the 19th (Town Hall) District. 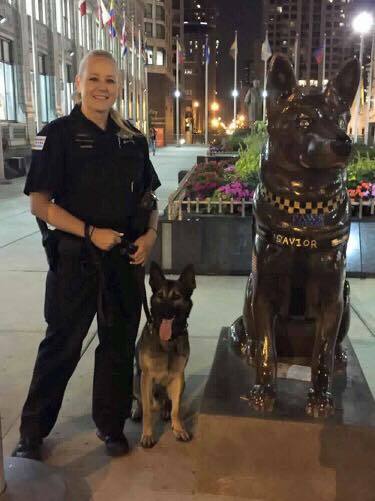 Funds raised by the project are going to the Chicago Police Memorial Foundation to help families of fallen Chicago police officers and PAWS Chicago, a no-kill animal shelter. Unique in our heart is “Savior,” a beauty of a dog that keeps a watchful eye on Tribune Tower from its post near the Wrigley Building. Friends of the Town Hall District sponsored Savior—raising over $3,500 for the charities along the way. Even cooler? The piece was designed and decorated by students at The Nettelhorst School in Lakeview. Savior will be returning to Nettelhorst in a couple of weeks. While many of the other K9s will go up for auction, Friends of the Town Hall managed to raise enough money to take ownership of this special pooch. And there’s no place better for our superhero to call home than the school that brought it to life. By the way, Chicago Tribune columnist John Kass wrote a fantastic piece a couple of weeks ago about Officer Bernard "Bernie" Domagala who passed away recently—29 years after his life was irreversibly changed by being shot in the line of duty. Give the piece a read. We highly recommend it.